A creative combination that exemplifies the next generation of experiential retail. With the advent of online retail, brick and mortar stores need to work a lot harder to get customers into their shops. This is an even greater challenge for seasonal stores, such as a bike shop in the middle of January, when the holiday shopping season is over, riders are few and far between, hardly any bikes need to be fixed, and customers are scarce. The Bike Rack in a new downtown outside of the Catholic University of America in Washington, DC offers a solution to this dilemma. 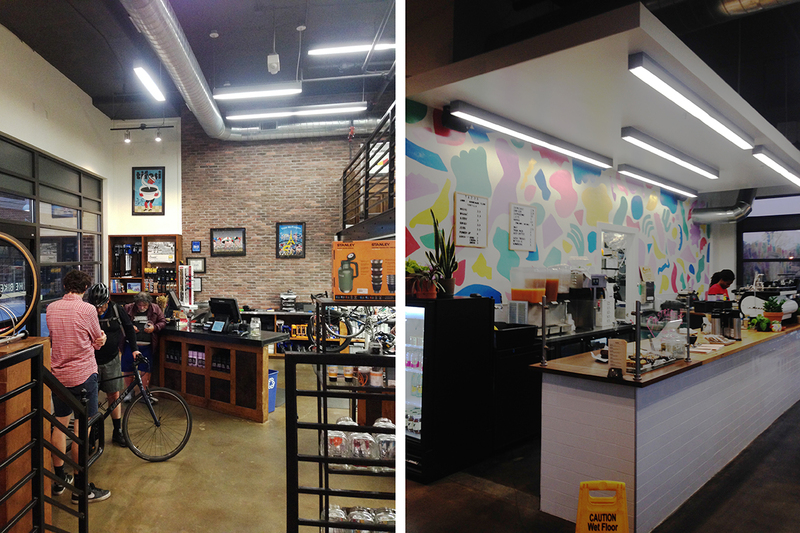 Putting two stores in one shop, they added food and dining to their traditional bike store, starting first with coffee and later with tacos, providing two offerings that feed off each other. The result is a winner -- an environment that is activated throughout the year and an ambience that pulls people in, making online shopping an inferior option. Known as Monroe Street Market, this new downtown is the result of a TOD master plan by Torti Gallas. Located right on a Metro stop, one of its primary features is an Arts Walk, where the bike shop is located. 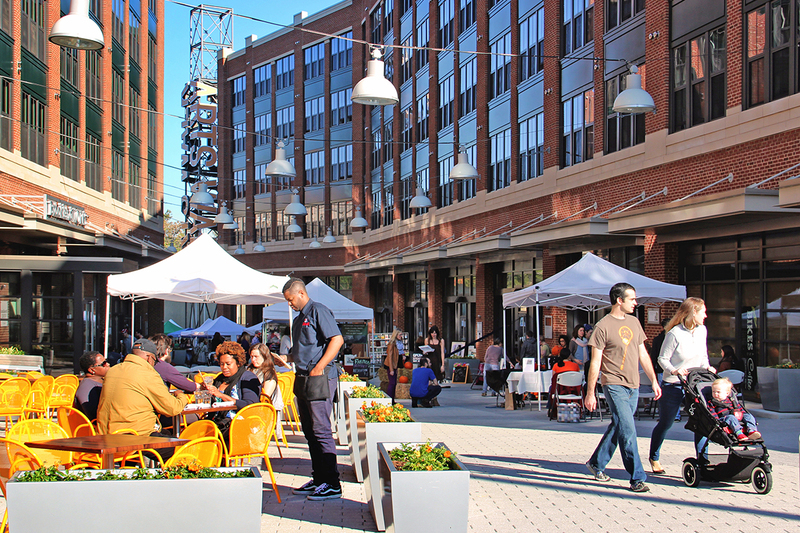 Lined with artist’s studios and craft shops with micro-units above, the Arts Walk weaves together new and existing infrastructure, and creates engaging public spaces that bring students, community members, Metro riders, bikers, and artists together. The studios have giant garage doors that open to the Arts Walk, inviting the public to engage with the artists and craftsmen, and purchase their wares. A number of restaurants and programmed events, including a seasonal farmer’s market and Thursday Open Studios, further enhance the space’s activity. 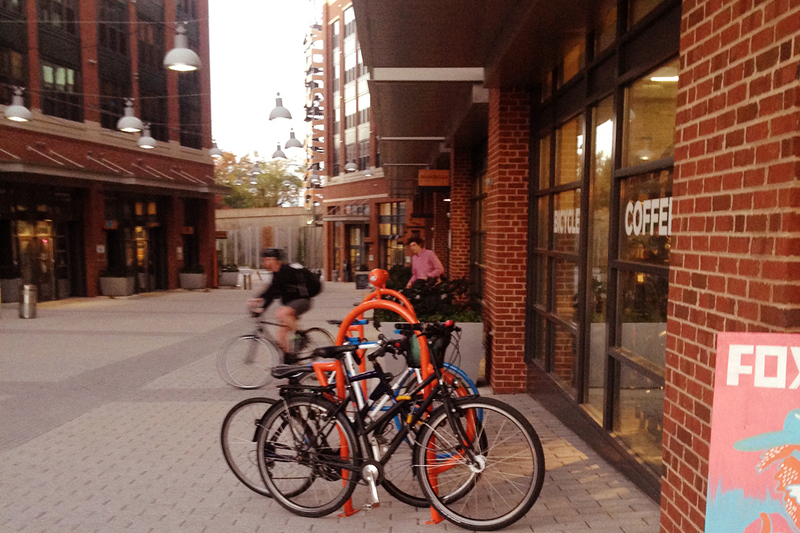 When first planning the project, the design team thought the location of the Bike Rack was perfect for a bike shop. Just off the Metropolitan Branch Trail (MBT),which runs from downtown DC to suburban Maryland, it is alongside the Metro stop, a bus depot, a major university and the Brookland neighborhood, a tightly knit community of small lot single family homes. With a storefront along MonroeStreet and an entrance on the pedestrian Arts Walk, the store has the feel of an Amsterdam market. At the Bike Rack, people may come in thinking they just need a cup of coffee and come out with coffee and a brand new bike. Drinking a warm cup of coffee while shopping changes a customer’s attitude, making the experience more pleasurable. Think about all those downtown holiday markets where you buy a hot cup of cocoa and spend oodles of time just exploring. That is how the Bike Rack runs all year long. They also match that pleasurable experience with service retail functions. With their location right on the MBT, they do a lot of quick turnaround bike fixes - “the bread and butter of the bike business.”And what better thing to do while getting your bike repaired than grab a taco before heading back out to the trail. The Bike Rack hopes to continue and grow on the bike and bean/taco combo. They know their pairing creates a richer shopping experience, something they hope to build on by eventually getting a beer tap, hosting movie nights, and other collaborative events with local community groups. As online shopping continues to grow, hopefully we will see more brick and mortar shops taking proactive steps like the Bike Rack, creating a new retail model where experience is the key.